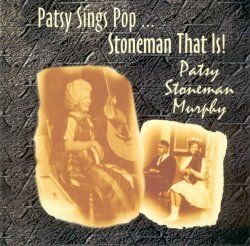 Patsy Sings Pop ... Stoneman That Is ! Well, what a pleasant and unusual suprise this is. But first a bit of background. Ernest V 'Pop' Stoneman (born Carroll County, Virginia, in 1893), a carpenter by trade but a banjo and autoharp player by choice, wrote to Okeh Records' Ralph Peer in 1924 requesting an audition, and recorded several discs for him the following year. Of these his recording of The Sinking of the Titanic was to prove to be one of the biggest selling Country records of the 78 era. Over the next five years he recorded well over 200 sides for a variety of labels (occassionally more than one on the same day) either solo or with his wife, Hattie, or in small groups made up of family, relatives and neighbours. These recordings preserved mountain songs, old British ballads, religious pieces and some of the most surreal of those rural comedy sketches popular with record buyers of the time, and established him and his family as influential Country Music pioneers to rank alongside the Carters and Jimmie Rodgers. As with many recording artists of the Twenties, his career did not survive the Great Depression and he was forced back to carpentry in a naval factory in Washington DC, while his wife Hattie brought up the family of thirteen kids. Several of the children took to music and Pop lead a family band around Washington in the late '40s and early '50s and, thanks to Mike Seeger, had an LP released on Folkways in 1957. Folk festival and college concerts followed and, in 1962, the Family made their debut on The Grand Ole Opry and won a recording contract with Starday Records. A move to Nashville resulted in a TV appearance on the Jimmy Dean ABC-TV show and then to their own TV series, Those Stonemans, in 1966. Pop died in 1968 but the family band continued for many years (so numerous were they that at any given time there were as manya s six Stoneman Family bands performing across the country !) - and may yet, for all I know. Well, Patsy Stoneman Murphy was one of those thirteen children (though by no means the most celebrated ... that honour probably goes to the controversial fiddler Scotty), and here she has gathered together a collection of 22 family songs, recorded in February 2001, which are mainly accompanied only by her own autoharp and (and here isthe unusual part), each is preceded by a short spoken introduction. The tracklisting reads like a veritable checklist of American Old Time Music - Don't Let your Deal go Down, Don't Bury me Beneath the Willow, May I Sleep in your Barn Tonight Mister, Little Old Log Cabin - witness to the impact that the family's recordings had on the music. But what might have been a mere recycling of old glories is somehow raised a notch or two by Patsy's enthusiastic and insightful comments about each. Although often heavy on recording dates, locations, record companies etc. she also has some nice little comments on her grandparents: Pop's home made autoharp; her mother, (with a hint at some,probably everyday, friction between Hattie and Pop); Uncle Eck Dunford; MikeSeeger; and the landmark 1927 Bristol sessions (or 'The Big Bang' as Patsy calls it). Don't get me wrong, this is not an in-depth interview, the spoken comments seldom stretch beyond 60 seconds each, but they are effective and interesting. On to the music: well, Patsy is no Dellie Norton or Ola Belle Reed, but her vocals are strong and clear and her autoharp playing brisk and accomplished. We are in the company of a veteran performer here - although, sadly, the notes give us no personal information about Patsy at all. And some of the performances are indeed memorable. The Raging Sea (sound clip) is an excellent reading of the old ballad, as are When the Snowflakes Fall Again, Sweet Birds, Tell My Mother I Will Meet Her (the 1927 recording is my all time favourite Stoneman performance) and Whippoorwill, which has particularly nice autoharp playing, bettered only by the excellent instrumental Stoney's Waltz (sound clip). A bit of variety is added by Patsy's jews harp playing on New River Train where she is accompanied (sadly on this track only) by some very fine banjo from Neal Walters, and by her own guitar on a good version of A Poor Tramp has to Live and Old Maid and the Burglar Man, which she delivers with some relish (sound clip). A couple of snippets from recordings of Pop -Titanic and a very fine Canaan's Land - also fit very comfortably within this collection. If the words 'honest' and 'homely' smack of faint praise, they should not, for, all in all, this is a most enjoyable release which should find interest amongst all lovers of Old Time American Country Music.